Christophe is currently working on developing new methodologies in flood loss assessment: on health loss asssesmenbt for the Environment Agency and on interpolation method for national plubial flood risk assessment for SEPA, in flood risk reduction strategies (FLORIS project). Christophe is also continuously working on improving the assessment of flood losses for the Multi-Coloured Manual (MCM). Recently he was involved in two EU projects: Risc-kit and WeSenseIt. In the WeSenseIt project, Christophe was looking at the potential changes in stakeholders' behaviour in the context of water resources management through the enhancement of knowledge as a result of advanced technologies (physical and social sensors). In Risc-Kit Christophe was leading a Work Package aiming at developing a coastal risk assessment framework. Christophe worked closely with the Urban Pollution Research Centre in two European projects (SWITCH and SCOREPP). Christophe's role in the SWITCH project was to develop a Decision Support System (DSS) based on GIS interfaces (SUDSLOC) and to couple it with a storm water model and a 2 dimensional flood model. The DSS aimed to demonstrate best management practices in storm water management. In SCOREPP he was in charge of the development of a database to support the visualisation of Priority Pollutant treatment options and he led the economic analysis of the options. He is also now involved in the PROPER project. 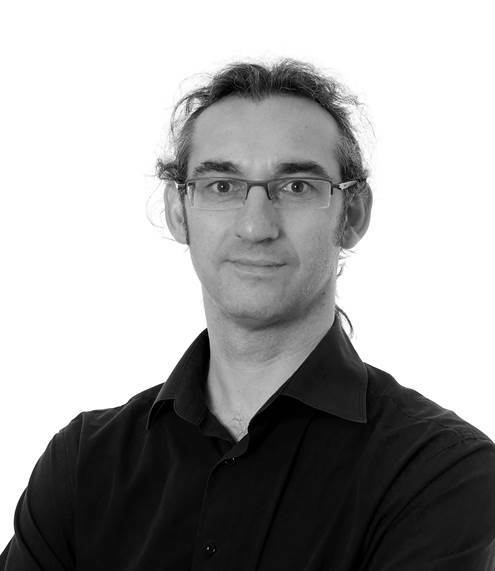 As the lead researcher for Geographic Information Systems (GIS) at FHRC, Christophe was involved in undertaking the mapping component of the EU RiskMap project and in the mapping of risk to life for the European FLOODsite project. He is also teaching GIS research method to MU students. Christophe is member of the MU Sustainable Development Research Cluster. Christophe joined the centre in 2007 following an 8-month post-doc at Ecole Nationale des Ponts et Chaussees and the completion of a PhD thesis at the Ecole Nationale Des Mines de Paris, focusing on the cost-benefit analysis of the impact of future nitrogen diffused pollution scenarios on the groundwater resources of the Seine River Basin involving groundwater modelling, GIS techniques and Agent based modelling approaches. Completed 2013: Meghan Alexander 'Social Vulnerability, Flooding and Risk Communication: Developing tailored GIS-based decision support systems and emergency flood incident management'. Christophe is teaching Global Sustainability Issues using problem-based learning techniques at Master Level (MSc SEM and BECA) and he is supervising undergraduate and postgraduate research project in sustainability studies. He is also teaching Geographic Information System research method. His research in flood risk management also contributes into teaching (MSc SEM Flood risk managment module). With skills covering a wide range of fields (Ecology, Geography, Modelling, Environmental Economics), Christophe's research is mainly focused on understanding how society can better manage the environment through the lens of the water resources and their associated risks (e.g. flood, drought, pollution). To answer these questions he is looking at how stakeholders may change their behaviour and adopt more sustainable approaches, but also at measuring the effectiveness of theses changes in terms of environmental, economic and social impacts. To better promote the research outputs, Christophe is interested in the development of innovative decision support tools for stakeholder needs. Christophe is also exploring the potential use of Agent Based Modelling approaches to better reflect the complexity of human decision and the impacts on the society (on water trading between Spanish Irrigation communities (EPI-water), on citizen engagement (WeSenseIt). Pasi, Ricardo and Viavattene, Christophe and LaLoggia, Goffredo and Musco, Francesco (2018) Assessing urban system vulnerabilities to flooding to improve resilience and adaptation in spatial planning. In: Smart and Sustainable Planning for Cities and Regions – SSPCR 2017, 22-24 Mar 2017, Bolzano, Italy.